These 6 entrepreneurs built successful businesses from America's favorite pastime. Cracker Jack, peanuts, hot dogs. It almost seems like ballpark food is more exciting than the game itself. And if Pati Grady has anything to do with it, we'll soon be adding shortbread cookies to the list of iconic ballpark snacks. In 2004, Grady searched online for a baseball cookie cutter to no avail. Improvising, she used a drinking glass to cut rounds out of dough made from her family's shortbread recipe and used a crimping tool to make stitches. Coincidentally, the cookies were the exact size of MLB regulation baseballs, and Grady sensed that she had the seed for a new business. 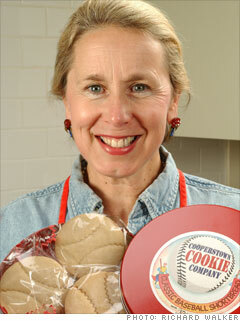 She incorporated and named the company Cooperstown Cookie, in honor of her hometown and the location of the National Baseball Hall of Fame and Museum. In 2008, Cooperstown Cookie scored official licenses with Major League Baseball and the Hall of Fame, doubling sales immediately. "It changed everything," Grady said. "And with licenses, the world of wholesale opened up." Today, she supplies her treats to stadiums across the country, from Busch Stadium in St. Louis to Seattle's Safeco Field. Grady also does a pretty brisk online business, selling cookies packaged in boxes and teams emblazoned with team logos.